In Windows 10 Home Edition, there’s a way to delay Updates from installing for up to five days. And here’s how you do it. Open Settings then go to Update & Security and click on Windows Update. Under Update Settings – click on “Restart options” (above). In the “Restart options” dialog, make sure the slider switch is turned to “On”. You’ll see a time and a date is set already for your updates to be installed. Select the arrow next to “Day” to expand the list of days available (above). 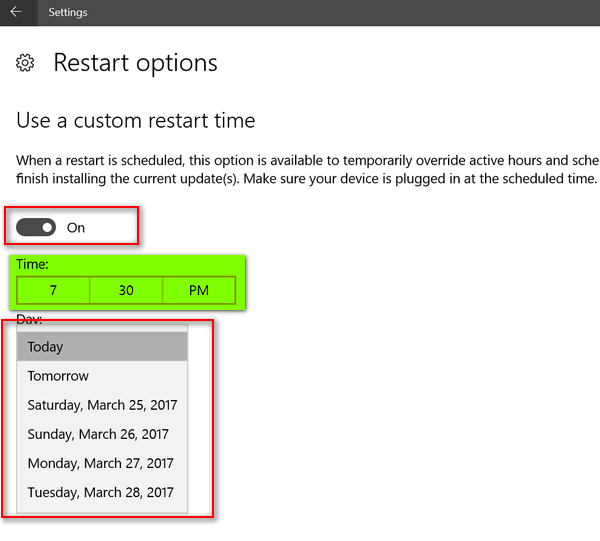 Now set the set the time and the day you want Windows to restart your computer to finish installing updates. Now when you go back and look under “Update status” you will see that your computer is now scheduled to restart at the time and on the day you selected. This tip will help you delay Windows updates for up to five days. 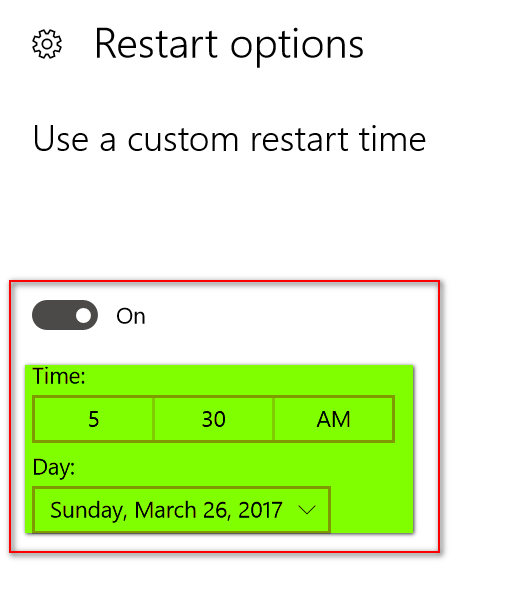 However, even if you set this, if you restart your computer before the day and time you selected above, guess what? Your updates will be installed at the manual restart and all your work to delay the updates will be in vain. This is a good way to delay updates without turning them completely off using the “Metered Connections” trick. Shutting off all updates using the metered connections method, also prevents you from getting important security updates as well. We don’t recommend this. 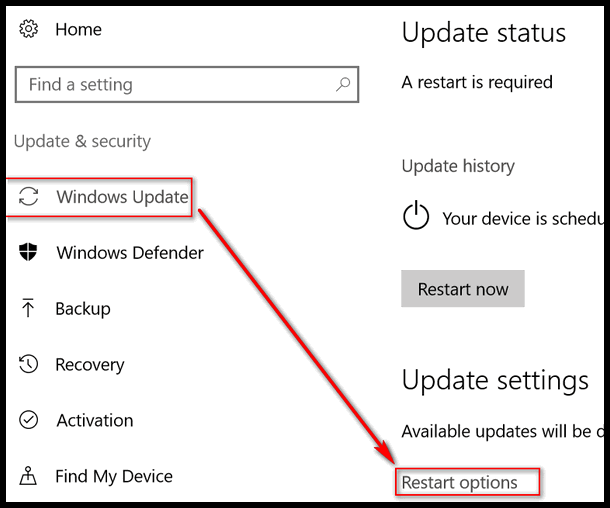 The method for delaying updates discussed in this article, gives all Windows 10 Home Edition users some modicum of control over when Windows updates are installed. You can delay important security updates for up to five days, but they will still be installed. And remember: Even if you set up this delay, if you restart your computer anytime during the “delay” period, the updates will be installed anyway. If you don’t know why you’d want to, then best you leave things as they are.